Unlike most SXSW parties, Vimeo and Nikon are joining forces this year to host an unforgettable party, featuring an awesome array of entertainment accompanied by a multitude of visuals and eye candy. Check out all the details after the jump. 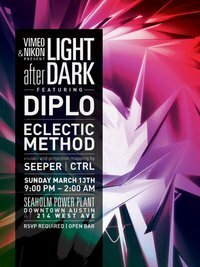 The event takes place 9PM-2AM at Seaholm Power Plant, 214 West Ave in Austin, TX. Admission is free and open to all badgeholders, 21+. To RSVP, click here.